Can you draw additional labs for me? Yes we can, but there may be some exceptions. Please bring the lab slip from your other provider. This insures that the results will get back to the ordering physician. Not all of our offices have access to couriers to all reference labs, so your lab work may go to our reference lab. This may only be an issue if your physician is monitoring a specific test. Occasionally if it’s a test with special collection requirements we may have to refer you to another collection station. Do I need to be fasting for blood work ordered by an Interlakes Physician? In most cases you do not have to fast for any test that we order at Interlakes. How long do I have to wait for my lab results? 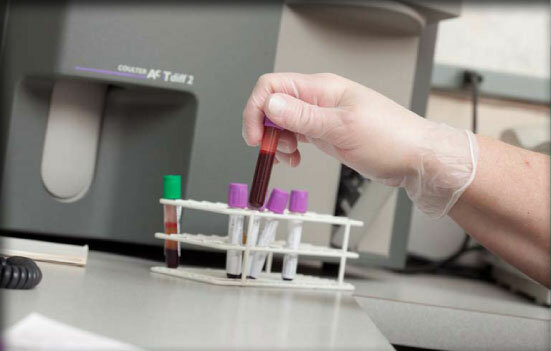 Most of our labs are equipped with a hematology analyzer on site. These offices can usually give your physician results of your CBC (complete blood count) within 5 minutes. All other tests are sent to a reference lab are usually available the next day. All of your lab results can be found on “MY CHART”. I just had labs drawn for another doctor, can you use those results? We will make every attempt to track down recent lab work. If it was not the tests that we need or it isn’t current enough, we will have to redraw you. What kind of training do the Lab Technologists have? All of our Lab Technologists have many years of experience. Most have degrees in laboratory science. Most are certified by the American Society of Clinical Pathologists. All are Licensed Clinical Laboratory Technologist in New York State. As part of the University of Rochester Clinical Labs, we are licensed by the New York State Department of Health. In compliance with New York State, our laboratories apply rigid laboratory standards to ensure quality in day-to-day operations, demonstrate continued accuracy in the performance of proficiency testing, and pass a rigorous on-site survey.